Houseplants are totally dependent on the conditions in their containers. Soil, drainage, light exposure, and nutrition has to be adjusted to their needs or they won't survive. Of all these factors, soil may be the most overlooked. It's easy to think that as long as you start your houseplant off right, it should continue growing just fine. Unfortunately, that's not the case. As potted plants grow full and leafy, their roots are also expanding. These roots tend to break down the soil in the pot, as they expand. This causes two problems. First, the lose of soil results in water simply washing through the pot. The water is not caught in the soil long enough for the plant roots to absorb it. This means your plant will wilt, even if you are watering it regularly. The second problem is that the roots will go looking for more room to expand and will start to wind themselves around in circles, breaking down more soil and girdling themselves in the process. This is what is meant by the term "pot bound". Sooner or later every healthy, growing houseplant is going to out grow its pot and become pot bound. When a plant gets too large for its pot and the roots circle around inside the pot, the plant's growth becomes restricted. If your plants seem to dry out more quickly than they used to, but are otherwise healthy, they are probably pot bound. There are simply too many roots in the pot and not enough soil is left to hold and distribute water. Fortunately, this is an easy problem to fix. Re-pot your houseplant into a pot an inch or two larger. This will not only give your plant's roots room to stretch out, it will also provide some new, fresh soil. You can reuse the old soil, just be sure to add some fluffy new potting mix. Only increase the size of the container by a size or two larger. It may seem counter-intuitive, but going too much larger will cause a different set of problems. 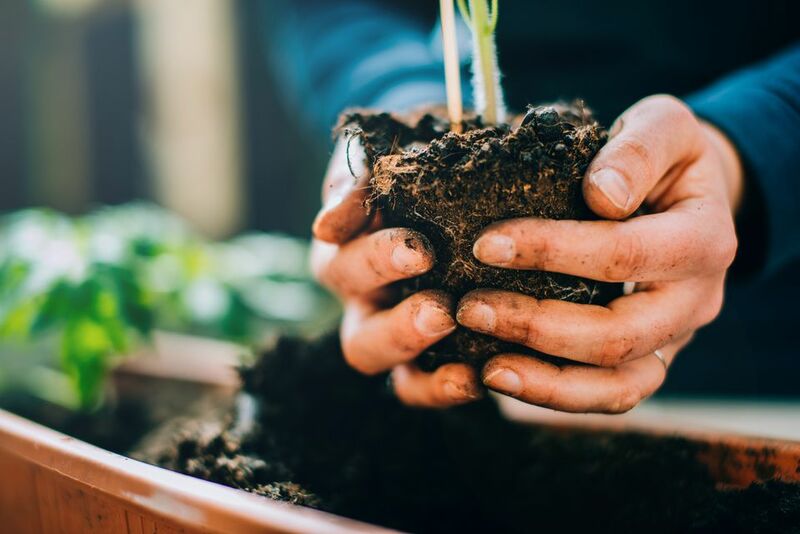 Too much excess soil will allow water to collect, rather than drain and that will result in the roots sitting in damp conditions, which will cause the roots to begin to rot. What if You Don't Have Room for a Larger Container? Sometimes you don't have room for a container and the resulting larger plant. If that's the case, you can maintain the plant's size by pruning back the top and the roots by about a third. Then you can re-pot, with some fresh potting mix, in the same pot. This will stress the plant in the short term, but it should recover quickly. Be sure to keep it well watered and out of direct light, until you see new growth. That's a sign that it has adjusted and all is well. While you are freshening the soil with some new potting mix, this is also a good time to add slow release fertilizer. Because houseplants are grown in potting mix, they are not getting any nutrition from the soil. Houseplants need to be fed every 2 to 4 weeks, during the growing season. Adding slow release fertilizer will make sure your newly replanted houseplant will get the burst of nutrition is needs as it acclimates to its new pot.